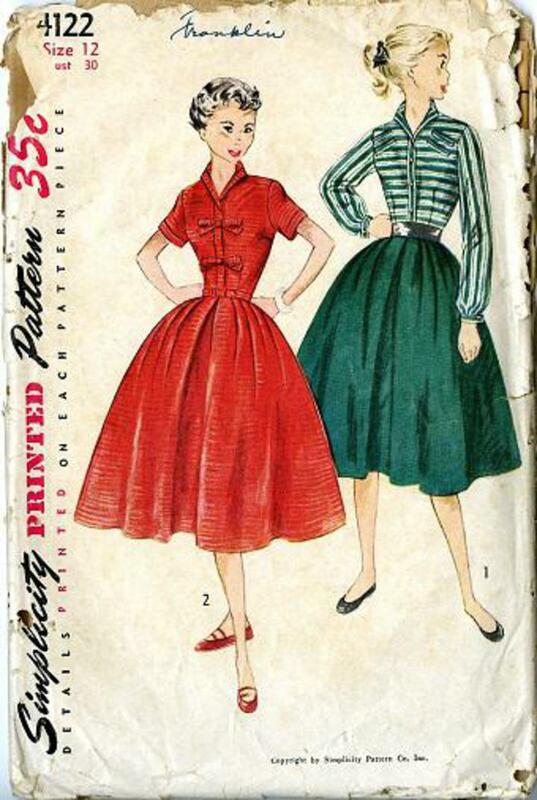 1952 Simplicity #4122 vintage sewing pattern, teen girl's fitted bodice dress and flared skirt, size 12. Bodice is detailed with bands and a small pointed collar. The full gored skirt has soft pleats at the waistline. V. 1 features welts sewn to the upper bodice front, long cuffed sleeves gathered at the lower edge and fastened with link buttons, and a contrasting skirt. V. 2 has short sleeves trimmed with bands and two small bows sewn to the front band.